MAY 2018 Translation of the Latin hymn from the 3rd Century: We fly to your patronage, O Holy Mother of God, despise not our prayers in our necessities, but deliver us always from all dangers, O glorius and blessed Virgin. May is the month dedicated to Mary, the Mother of God and our Blessed Virgin Mary. 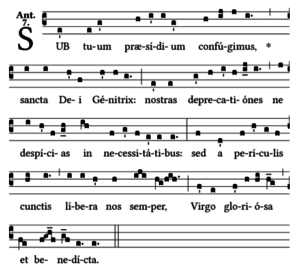 Here at the monastery we sing this particular hymn, entitled “Sub tuum praesidium,” (your protection) every day after the Divine Office of None. 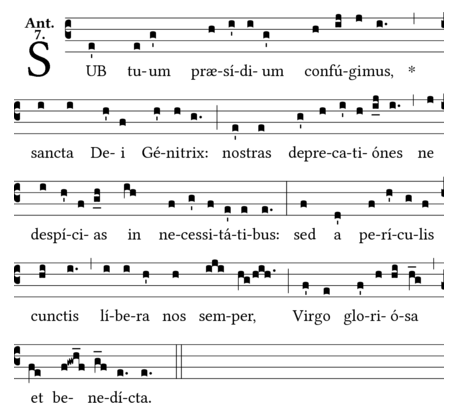 We also include a hymn to Mary right before the Blessing by Prioress Hilda after Compline. 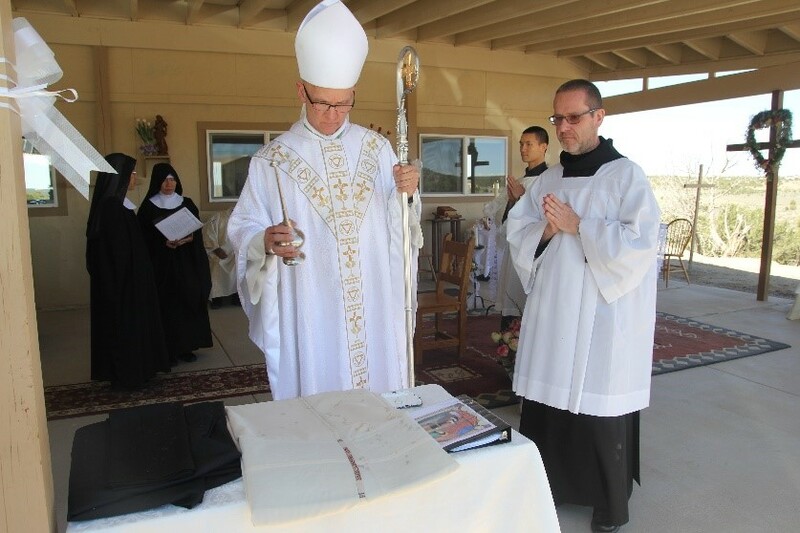 Finally, as you know, the title of our monastery emphasizes our devotion to our Lady. Mary serves not only as a humble model of silence and obedience for us, but also as a model of discipleship. As a disciple of Jesus and Mary, please join us in thanksgiving, for another final profession this year, that of Sister Frances Nguyen, April 23, 2018. 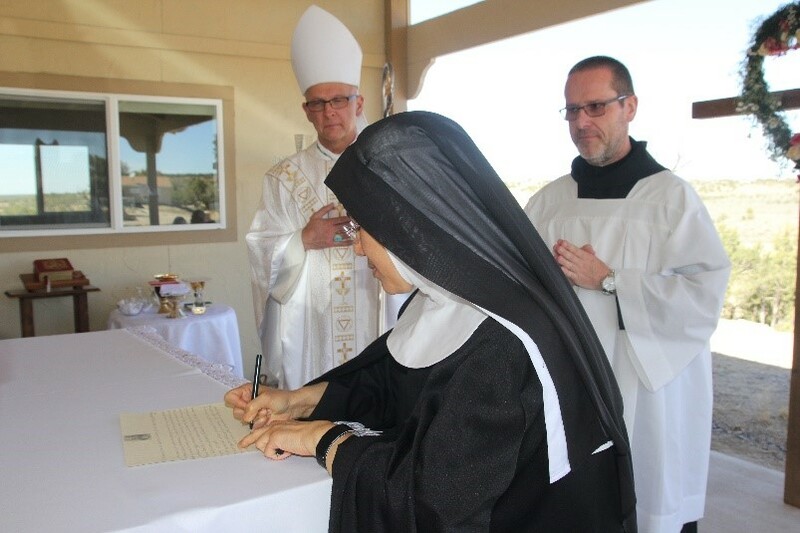 The Solemn Monastic Profession and Consecration of Sister Frances was celebrated by +Most Reverend Bishop James Wall, Gallup Diocese and other concelebrants: Msgr. 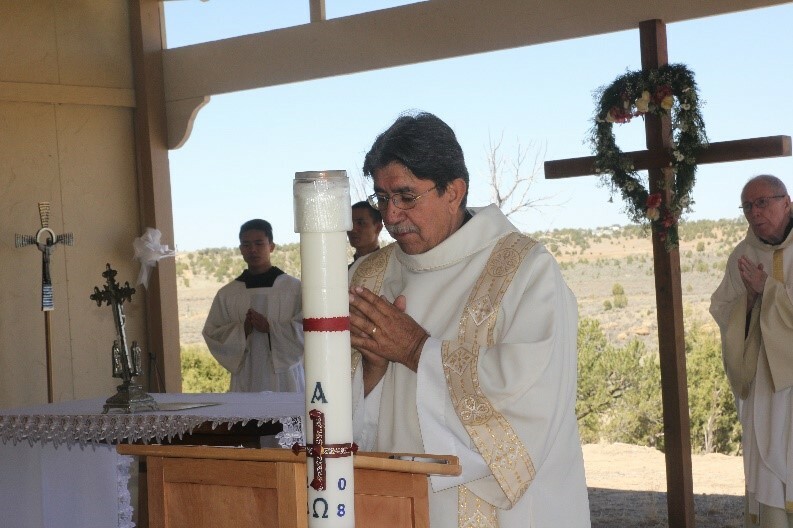 Leo Gomez, Fr. Jeffrey Steele, and Fr. David Tate, and also Deacon Pat Valdez. 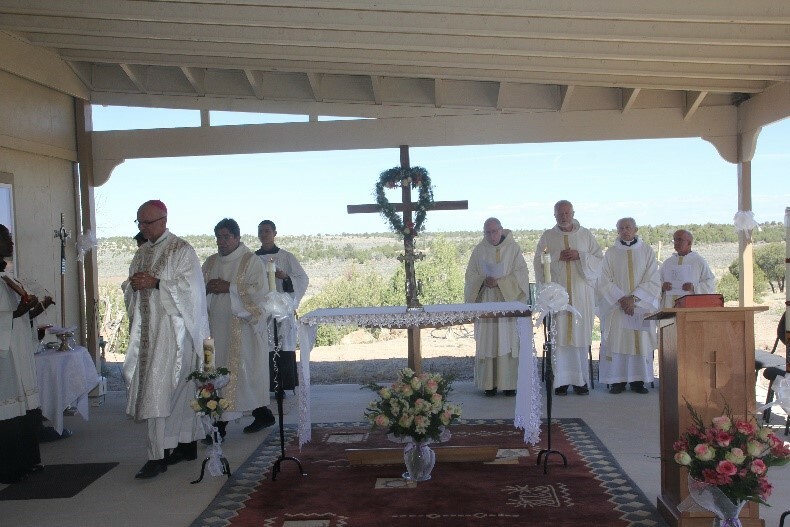 The festivities were held at the St. Joseph Center, here at the monastery. The weather was almost perfect, with blue skies, and a little wind. The Divine Providence group made a delicious meal and as always, we are grateful to Marie Colon, for the delicious rum cakes that she baked for this occasion. Our friend, Carol, flew in from New York to be present and read the 1st Reading at the Mass. It was a joy to have some of our local friends and many of the monks from the Monastery of Christ in the Desert, helping with the Vietnamese singing. 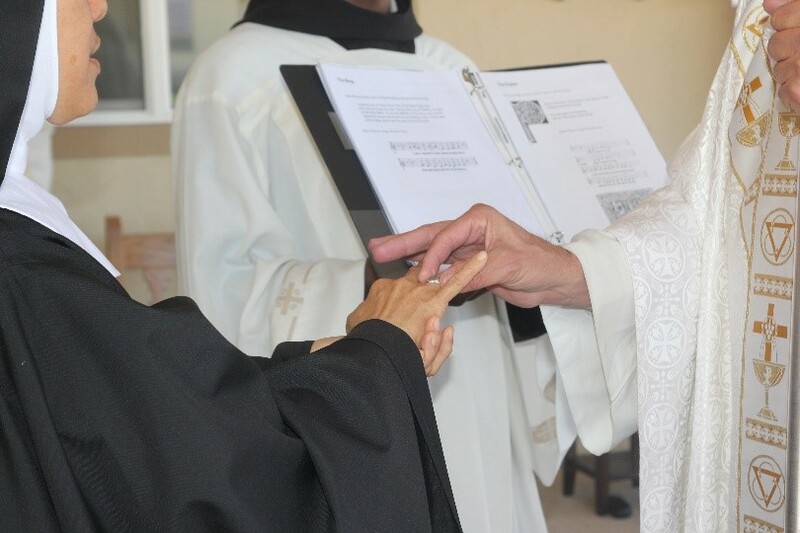 As Sister Frances takes this life time commitment, she is now a part of the formation team, teaching Lectio Divina. Also, her assignment of Liturgy keeps her busy in organizing the music and she is very enthusiastic in helping the members of our community to sing with zeal the praises of God. Please pray for us as we will have our second Canonical Visitation in June. 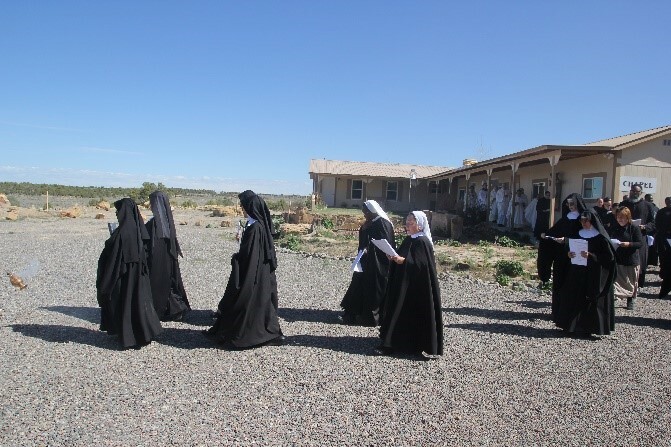 As explained in the July 2015, Newsletter, the purpose of this Visitation is to help the community grow in self-understanding, to recognize and acknowledge the strengths and weaknesses, to identify what should be corrected or eliminated in our monastic life and to help with the vision and values. 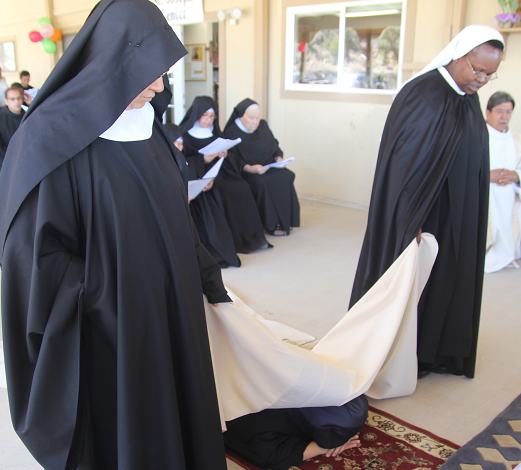 On April 23, 2018, we celebrated the Final Profession of Sister Frances. The weather was very nice and sunny with a little wind. +Most Reverend Bishop James S. Wall was the main celebrant, followed by a delicious luncheon. 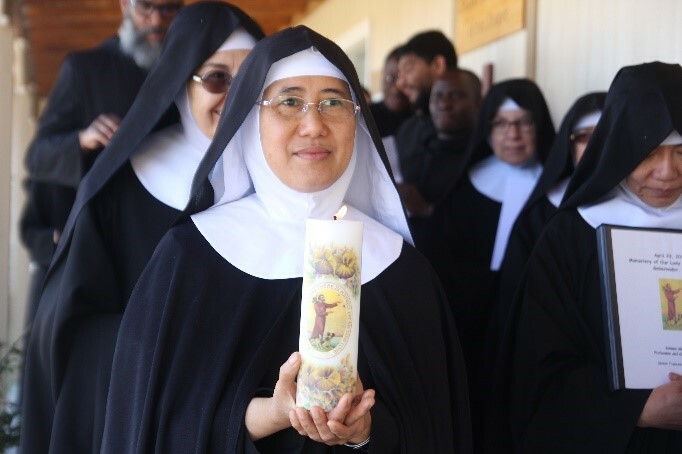 And now, Father, we pray you: set the heart of Sister Frances on fire with your Holy Spirit. May the face of Christ shine upon her and may all who see her discover Christ’s presence in the Church. Father, look in love upon Sister Frances, sanctify her and bless her.